Fresh blueberries, apple tarts, and a bowl of cherries. I admit it; I kind of like to photograph food. Mainly on the sweet end of the food spectrum. Yes, I have joy in downloading my pictures and getting hungry just looking at them. I think it has something to do with the lighting and texture, but that just might be an excuse. I know, I'm weird. So to celebrate my individuality, I'm bringing you a recipe created by Martha Stewart herself (or at least in her food magazine) and photographed almost Pioneer Woman style. 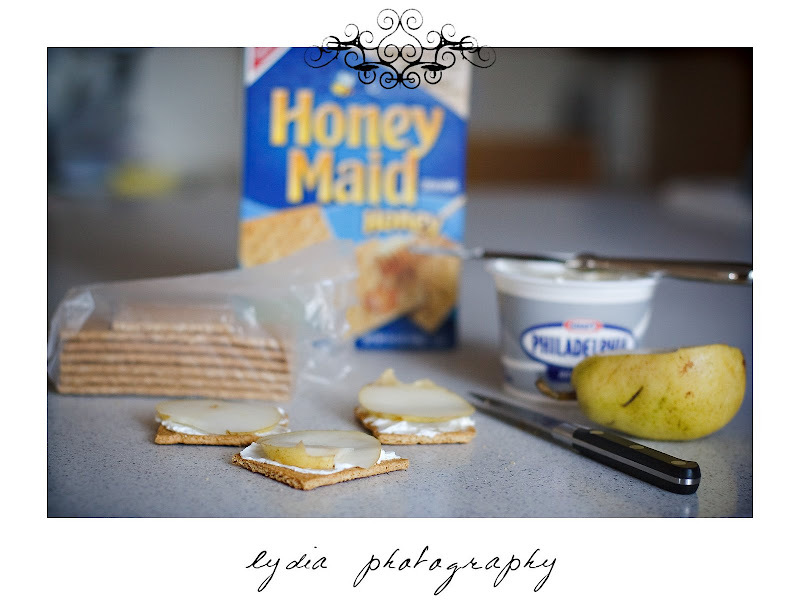 Spread cream cheese over graham crackers. Slice pear and place on top of cream cheese. Take bite and wonder how you never thought this up years ago. If you don't have pears, try apples. Let me know if you come up with any fun combinations! ah, so you read the pioneer woman, too! love that you document daily life. and make it so dreamy and delicious.